KOLIN is there to enchant you with its unpredictable character. Decorative, feminine, sensuous, yet kept in a minimalist feel. Transparent details, frilled hemming at the sleeves, side stripes on the net sleeves finishing in frilled hemming… KOLIN is made up of all these. Obviously, it may not be an easy companion to other pieces, yet the upshot is worthwhile going to an effort of styling it with discernment. 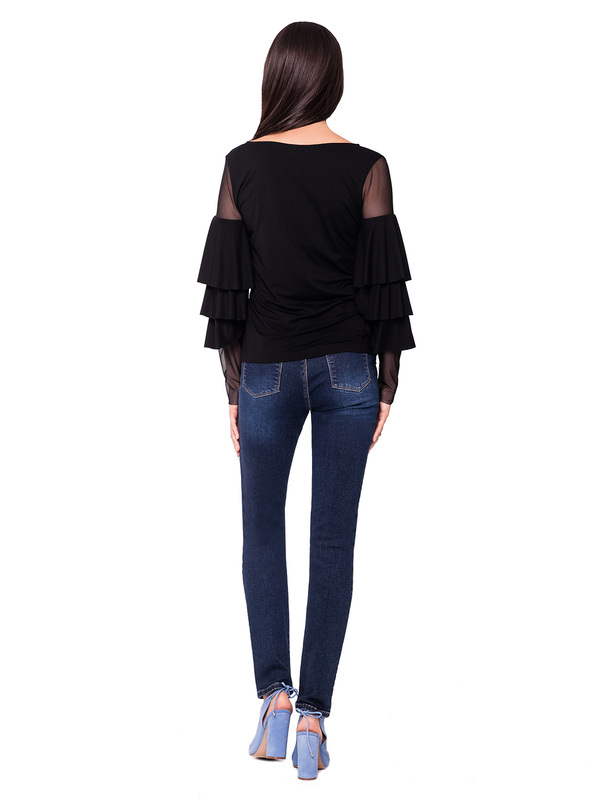 Go for KOLIN top when creating an evening look. It will play nicely with darker jeans, in particular ones featuring fancy embroidery. If you couple it with classic black slim-fitting trousers, a black total look is all set. We also suggest matching it with a fitting-cut leather skirt or one made from fabric featuring a metallic sheen. Irrespective of the bottom piece, a pair of high heels and lavish jewellery are always welcome!